In game 2 of the NBA finals it was looking as if Miami would run away with the game. They were up 15 points with just 7 minutes left in the game. 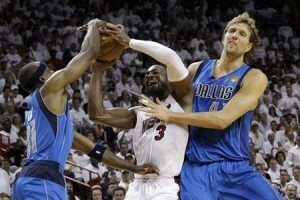 The Dallas Mavericks were missing shots, turning the ball over and committing obvious fouls. Then Dwayne Wade hit a three-pointer in front of the Dallas bench. After the shot Wade kept his hand up and was quickly joined by Lebron James who commenced to beat on his chest and yell into his Wade’s ear. To the Dallas Mavericks bench it looked like a celebration right in front of their bench. This was apparently the motivation that they needed. Jason Terry looked at Dirk Nowitzki and said, “There’s no way we’re going out like this.” Dallas went on the score 6 unanswered pints and eventually overcame the 15 point deficit to win the game 95-93. Now the series is tied at one game each. The series will resume in Dallas on Sunday night.